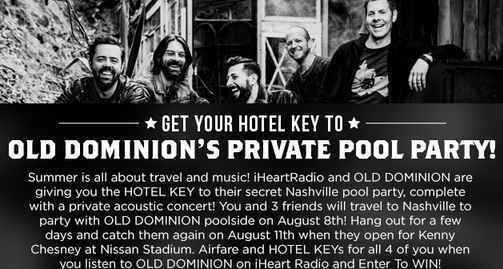 iHeartRadio has teamed up with OLD Dominion to brings you the iHeartRadio Old Dominion Pool Party Sweepstakes where they are giving you the Hotel Key to their secret Nashville pool party. You and your three (3) friends will travel to Nashville to pool party with OLD Dominion poolside on August 11, 2018. How To Enter: During the sweepstakes period go to this link: https://news.iheart.com/contests/get-your-hotel-key-to-old and follow the online instructions to register by entering all information requested on the registration form and once you filled out the entry form now Click on the submit button to complete the registration form. Four (4) VIP passes to the Old Dominion experience prior to the Concert. When To Enter: The iHeartRadio Old Dominion Pool Party Sweepstakes entry begins on July 2, 2018, at 12:01:00 a.m. ET and ends at 11:59:59 p.m. ET on July 15, 2018. Who’s Sponsor: The sweepstakes is sponsored by iHeartMedia + Entertainment, Inc.